I wrote an earlier article about the frustrating and dangerous design of the new fall-away stove handles on the latest versions of Dutchwest wood stoves. Basically, their new handle design make loading and using these stoves unnecessarily dangerous. Within days of my writing that first article, the fall-away stove handle fell on the hearth and shattered. This made it useless instead of dangerous so I made a temporary fall-away handle out of wood. You can see it here along with the fragments of the original fall-away handle. 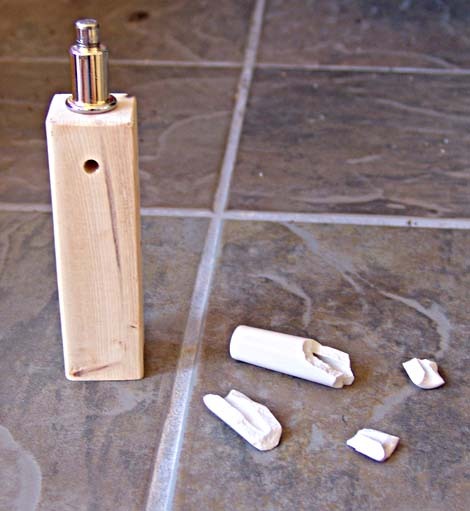 The original handle had lasted for only three weeks of use, so we can add fragile to the list of adjectives like useless and dangerous which describe the "new improved fall-away stove handle" from Vermont Casting. The design specification used by the Vermont Casting team must have been a doozy. I followed up my original article with an email to Vermont Castings and received a form letter in response. There is no way to contact the company and interrupt the thought processes of the design and marketing teams which are creating unsatisfactory products for us wood stove users. Wood stoves are so 19th century, after all, that it is probably reasonable that Vermont Castings regards customers as sources of money rather than as sources of feedback. It seems likely that newer stove companies like Pacific Energy and SCAN may make greater inroads in the wood stove market if they augment their design activity by listening to what stove buyers are saying. I realized that it will be a cold day in Hell before I would hear from the Vermont Casting design team, so I created safer stove handles for these Dutchwest stoves out of material you can buy on ebay and in your local hardware stove. These springs come in a variety of sizes and materials. You can buy them on ebay from a number of sources. I bought sample handles in black, brass, and stainless steel and chose the stainless spring handles because their size would allow me to make a simplest modification to the stove. These springs are almost 5 inches long and they can be threaded on a 5 inch long 7/16 bolt to make a sturdy and safe handle. I bought four 7/16 bolts from the local hardware store along with a 7/16 thread cutting tap. 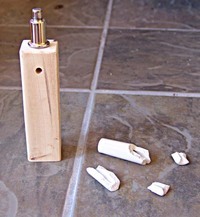 I used the tap to cut threads into the sockets of the four handle stubs attached to the wood stove. Then I screwed the bolts and springs into the four stubs and I got the result you see here. The handles are large enough to operate the doors easily and the springs ride loosely on the bolts which cuts down on the heat transfer from the hot stove. The ventilated springs stay relatively cool and I could touch them with my bare hand when the stove is hot – but I do not recommend that under any circumstances. I always wear heavy leather stove gloves when opening the stove doors because I am handling heavy pieces of wood and the stove doorway is very hot. The gloves protect me when I stoke the fire or adjust the position of the wood. These DIY stove handles cost approximately $40 including the thread cutting tap, so it is an affordable solution to the shortcomings of the original handle design . If you are unhappy with the fall-away handles on your new Dutchwest wood stove, this might be the solution you are looking for. Nice job! They look like they belong on the stove. Perhaps Vermont Casting’s design department should pay you a design fee and acquire the rights to your design! Looks good! Nice problem solving, buddy! Elegant and workable solution! CONGRATS on making this work! Interesting solution. They look similar to the handles on the wood stoves my parents had over 40 years ago. The old handles were smaller, the wire shinier (from use, I’m sure) and the size of the wire slightly thicker. Colleen, if you have any questions, I will be glad to help wherever possible. As I said earlier, I was able to find several different wire spring handles on ebay. The stainless steel ones turned out to to be the best. We have been using them constantly in the weeks since I made them with no problems at all. The hardest part was getting the threads started with the 7/16 tap because the holes in the stubs are only 1/4 inch deep. I ground off a little of the end of the tap so that I was able to cut threads almost to the bottom of the hole. If I had used a cutting lubricant, the job would have ben easier. When my handle broke, I used a three inch piece of 1/2 inch copper pipe. It fits right on using the original bolt. It looks good too. Copper & Brass. 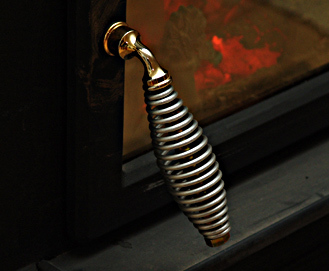 I’ve looked all over eBay using different keywords for these great looking stainless steel spring stove handles and cannot locate them. Do you know of anyone else that might have 8 for a custom built BBQ smoker? My original ceramic handle broke early in the first season that I bought it. I was going to replace the ceramic with wood, but noticed the allen bolt underneath the original handle stubs. I would prefer to remove them and replace with a full size handle if I can find one somewhere. The original design is unsafe, because it encourages people to try to use the nubbin knob to open the door. And, it’s always inconvenient to use the fall-away handle because I have to keep it up high from the kids. How do you like the Dutchwest? I am in the market and it is the cheapest (price-wise) of the Jotul, Pacific Energy, Vermont, and others I have looked at. I was quoted $1549.00 cash and carry plus tax for the Large (2479) Model. David says: I really like the Dutchwest stove. I bought the medium sized model and it heats a 1650 sq ft house easily in the coldest weather. You have a good price. I was going to buy the Pacific Energy stove, but they do not have it in our area. 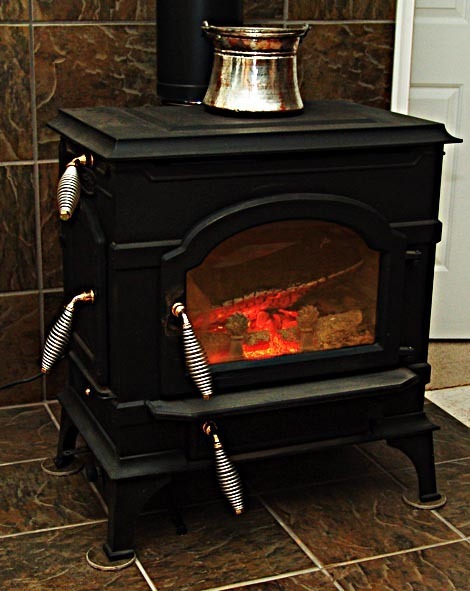 The Dutchwest has a great traditional look and it is a great value, except for the damned fall-off stove handles. Have you had any trouble with the internal fiber burn pack in your Dutchwest non-cat cast stove? Ours was cracked upon delivery so the stove didn’t burn right. While VC replaced it under warranty, we only made it half way through a second season before we had a second disintegrated Fiber burn pak (secondary burn chamber). This time the part is $450 so we are looking for a new stove that won’t require such costly maintenance. What seemed a good value at the time has turned out be a very expensive mistake in just two years. Nice job David! In an earlier career, I worked for an industrial supply company and I was always fascinated by the products that my customers produced. The next time you need a tap for a blind hole, ask for a “bottoming” tap and you won’t have to grind the tip down. Hardware stores won’t always have these but any industrial supply company should have exactly what you need. Something about making your own threads is satisfying, isn’t it? Woodmans Plus has brass spring handles that are a bit shorter and look good too!